Don’t be fooled by the references to Dubliner Quesadillas or a Kilkenny’s Country Chicken Wrap. 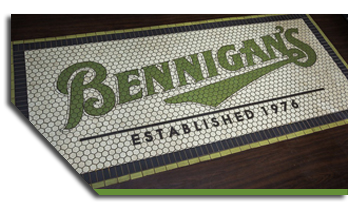 When it opens soon in Sacramento, Bennigan’s will have a distinctly local feel. That’s according to Maninder Trewn, president of Calben Inc., the group that will operate the downtown restaurant. “There is a buzz. I can feel it,” he said of the new location. Trewn is aware of the concerns that surfaced after news spread that Bennigan’s, an Irish-themed restaurant chain from Dallas, would fill the spaces previously occupied by Paragary Restaurant Group’s KBar and Cafe Bernardo at 10th and K streets. Many of those concerns centered on the fact that Bennigan’s is a chain restaurant. But Trewn said the 7,500-square-foot local site, tentatively scheduled to open June 5, will have unique elements. Savannah, Tennessee-based Design Team Sign Co. LLC will soon add a wall-to-wall mural to the interior, featuring Sacramento landmarks. There will also be a “Capitol Room,” designed for meetings and banquets for up to 60 guests. The remodeling cost for the project was between $550,000 and $600,000, according to Trewn. That does not include the purchase price for the KBar and Cafe Bernardo businesses and lease for the location, which Trewn did not disclose. He’s hired between 80 and 90 people for the casual restaurant, which will stay open until 10 p.m. on most nights, and until 1 a.m. on Fridays, Saturdays and nights with events at Golden 1 Center. Expect a menu with burgers, sandwiches and salads, along with bigger entrees such as ribs and seafood.